It consists of circular cement pools (8 m diameter) with 50 cubic metres of water holding capacity. The bottom of the pool slopes to the centre, where there is an outlet pipe (10 cm diameter) leading to the incubation pond (egg collection chamber). The wall of the spawning pool is provided with diagonally fitted inlet pipes at an angle of 45o for circulation of water creating artificial riverine conditions. After circular pool is filled with water, about 80 kg of females and 80 kg of males are released into the pool. When the breeders start coming up to the surface, the valves are opened so that a circular current is created. The speed of water current is maintained at about 30 m/min. The yield of 10 million eggs per breeding operation is usually achieved. As spawning goes on in the spawning pool, the fertilised eggs are led into the incubation pool (3 m diameter - double walled circular pool, with inner wall of regulated mesh permitting outflow of water) where water at a regulated speed enters through the duck mouth valves fitted on the floor of the outer chamber. The speed of the water is regulated @2.5 litre/sec in the initial stage and then reduced to 2.0 l/sec when movement of embryo inside the eggs starts. After hatching, the speed is again increased to 3.0-3.5 l/sec. and the hatchlings are allowed to remain there for about 3 days till the yolk sac is absorbed. Presently two techniques are practiced. Rearing in earthen ponds at the fish farm. Two phased seed rearing - Phase one inside the hatchery building and phase two rearing in earthen pond at fish farm. From the hatchling receiving ponds (nursery ponds), the weeds are removed. 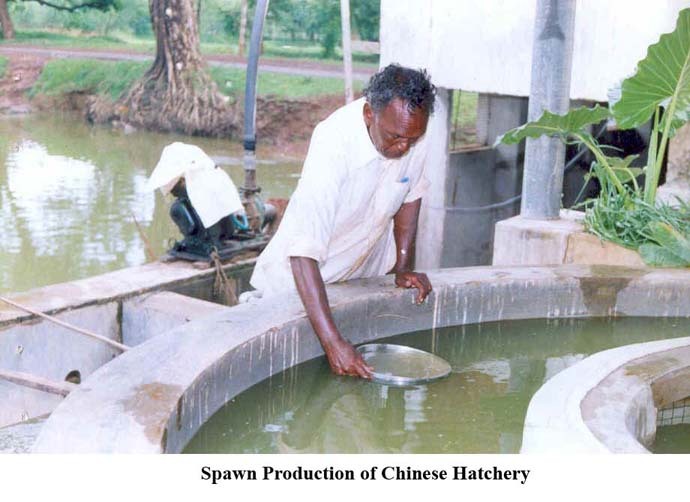 Unwanted fishes are removed using mahua oil cake containing 4-6% saponin at the rate of 2000-2500 kg/ha meters. Lime is applied @ 250-300 kg/ha. for neutralizing acidity and helping mineralisation of organic matter. Manuring of ponds with cow dung @5000kg/ha is done about 15 days before the anticipated date of stocking by broadcasting all over the pond (dose of cow dung is doubled when Mahua oil cake is not used). Aquatic insects are controlled. Suitability of water is tested. Thereafter ponds are stocked with about 3-4 days old spawn usually in the morning hours. The moderate rate of stocking may be 25-30 lakhs/ha. Supplementary Feed: A mixture of finely powdered groundnut/mustard oil cake and rice bran/polish, in equal proportion by weight is supplied to the fry. Cobalt chloride or Manganese sulphate (trace elements) @ 0.01 mg/day/spawn may be added to the feed. Addition of yeast increases survival of fry. Feed may be broadcast all over the pond commencing from the day of stocking. Feeding may be stopped one day earlier to the harvesting. The generally recommended feeding schedule is given below. Feeding should not to be suspended in adverse ecological conditions. The location of a Chinese Hatchery should ideally be on a sloping high land for economical construction. If sloping land is available the floor level of the spawn collection tank should be adjusted to the ground level for draining out water by gravity. The level of eggs transfer outlet located at the centre of spawning tank should be about 10 cm. above the level of central overflow pipe at the top of the hatching tank. This will enable complete transfer of eggs from the spawning tank to use outside the tanks. Overflowing water from the hatching tank should not be passed on to the spawn collection tanks but should be put to use outside the tanks. Separate fresh-water supply lines should be installed from the overheads water tank to each tank i.e. spawning tank, hatching tanks and spawn collection tanks in order to ensure independent working of each. Water spraying arrangements should be provided for aeration and oxygenation in the three tanks. Eggs transfer pipe should discharge the water along with eggs into the hatching tank in between the two walls of the hatching tank to avoid damage of eggs. The walls of the spawning tanks should be provided with water inlet pipes installed in a diagonal position to create a circular water flow during the spawning period. Where water flow is insufficient for circulation, multiple-chambered hatching pools with paddle wheels for circulation may be constructed. 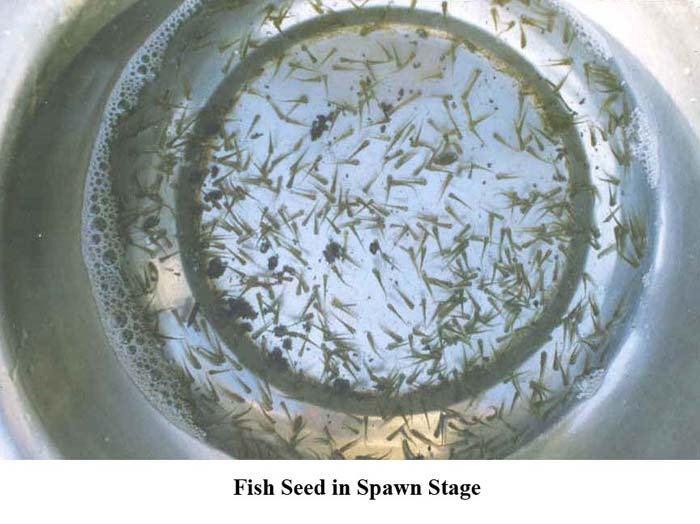 In nursery ponds the fry usually grow to a size of 25–35 mm in about a fortnight with more than 70–80% survival, when they become ready for harvesting. Harvesting is done by seining the pond water using a close meshed (1.45 mm) drag net. Several netting operations should be done to ensure near total harvesting of the stock. No harvesting should be done on a bright sunny day or in cloudy weather as there might be heavy mortality of tender fry due to high temperature related increased metabolism and the depletion in available dissolved oxygen. The most suitable time for harvesting is the early hours of the morning. Feeding should be stopped a day before harvesting to minimize the conditioning time required for transporting fry over long distances. Harvesting of fingerlings should be done after three months of rearing when they attain the desired size of 100–150 mm. However, in some cases fingerlings are to be kept for a prolonged period for marketing during the period of scarcity of seed to fetch better price. Harvesting should be done by seining the pond using a drag net of about 8.0 mm mesh. However, complete harvesting of all the species, especially the bottom feeders is usually difficult and hence several netting should be done to ensure near total harvesting. A modified form of net, which is described below, is very effective in catching all the species of carps even in rearing ponds. Feeding should be stopped a day prior to harvesting. For transporting live fish and fish seed over exceedingly long distances and from one country to another, closed system of transport is most suitable. In this system of transport live fish/seed materials are packed in closed containers with oxygen under pressure with airtight seals. Polythelene or vinyl chloride or other plastic bags of various capacities ranging from 15–35 litres are in use. Number of seed materials to be packed per bag vary according to their size and expected duration of transport.